Here is what my kids are wearing for Halloween. 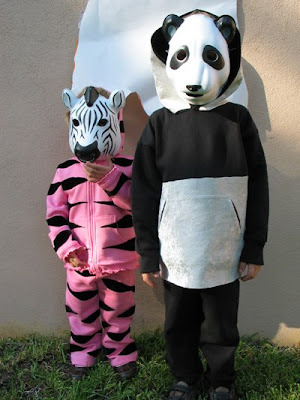 A pink Zebra and a Panda Bear. I'll be passing out treats and watching old Frankenstein movies. Can Obama outperform in Texas? Barack Obama is not trying to win in Texas. We have clearly been written off as a solid red McCain state, and I can’t much blame them. Texas hasn’t voted for a Democrat for president since Jimmy Carter in 1976. I have no expectations that is going to change this year, especially with the campaign making no effort in this state. But I am curious how well Obama will do despite not trying. Will he do better than previous Democrats? The high-water mark for a Democrat in Texas since 1980 was the 44 percent of the vote that Bill Clinton drew in 1996 during his successful re-election race against Bob Dole and Ross Perot. Every other Democrat has drawn less support as a percentage (I’m not sure about total votes). In 1980, Carter won 41 percent of the vote in Texas. Four years later, Walter Mondale set the low mark with just 36 percent of the vote. Hell, I didn’t even vote for Mondale that year. In 1988, Michael Dukakis (with some help from Lloyd Bentsen) managed to get 43 percent of the Texan vote. Clinton took an unimpressive 37 percent his first time around in 1992 against Carpetbagger Bush and Ross Perot at the height of his popularity. Since 2000, Democrats have been stuck at 38 percent which is what both Gore and Kerry polled against the former Governor of Texas. But what about this year? There are no Texans on the ticket on either side for the first time since 1976, and the polling average for the state currently has Obama at 43.5 percent. So will he do better than Clinton in ‘96? What’s your guess? Here is evidence that nearly a quarter of my fellow Texans are complete and utter morons. When asked to identify Obama's religion, 45 percent of respondents accurately identified him as Protestant; however 23 percent erroneously identified him as Muslim. Please, people, stop watching Fox News! You are making all the rest of us Texans look bad. Yesterday Republicans launched two new attacks that were beneath contempt. First, Sen. Liddy Dole, R-N.C., released an ad attacking her Democratic opponent Kay Hagan because a member of an atheist advocacy group was one of 40 sponsors of a fundraiser that she attended. The ad accuses Hagan of taking “Godless money” and goes so far as to have a voice impersonator make it sound like she says “There is no God.” at the end of the ad. Kay Hagan is a Sunday school teacher and an elder in her church. The ad is despicable and Liddy Dole has disgraced herself by airing it. But guilt by association is all the rage now on the Republican campaign trail and Sarah Palin tried to spook her audiences the other day by noting that while he was a professor at the University of Chicago, Barack Obama actually knew and had cordial relations with a MUSLIM!!!!! Shreeeeeeeeeeeek!!!!!!!!! I assume that the only acceptable thing that Obama could have done in that case would have been to spit in the guys face everytime he saw him. Apparently that is what Republicans do when they see a Muslim, assuming they dare to get that close. Most probably just point, screech “TERRORIST! !” and run for cover. Jonathan Gurwitz sure is bitter. Like most Republicans these days, he has given up on McCain/Palin winning the presidency. But he is still using his gold-plated soapbox on the Express-News editorial page to lash out at Barack Obama with unfair and misleading statements. ....recent events have broken Obama's way — amazingly, since Democrats have controlled both houses of Congress for the past two years, and Obama has been a Fannie Mae patron, while John McCain has been one of the few voices calling for reform. First, Gurwitz acts like Democrats having control of the House and slim control of the Senate for the last two years means they and not the Republicans should be held responsible for the mess that Bush and the Republican policies have created. He knows better. The change in congressional leadership in 2006 has kept Republicans from putting any new policies in place, but it has not allowed for the reversal or elimination of any of the existing policies due to veto threats and filibusters. And it just boggles the mind to hear him call McCain a voice for reform when his chief economic advisor, Phil Gramm, was the author of the bill that created the deregulation disaster to begin with. Obama promises everything to everyone: entitlement reform and full benefits; spreading the wealth and a tax cut for all; a unilateral rewrite of treaties and free trade; gun ownership and a ban on handguns. Like most rightwingers today, Gurwitz falls into the fallacy of treating everything like it is only black or white, all or nothing. You can have entitlement reform and maintain full benefits for those that need it. You can have a tax cut for most by rolling back the tax cuts for the wealthiest. You can rewrite treaties and still have free trade. You can have responsible gun ownership while supporting common sense restrictions that protect the public and law enforcement. All you need is someone in charge who doesn’t where ideological blinders and only sees the world in black or white. Obama's meager record of legislative accomplishments, his non-existent record of bipartisanship and his lengthy record of working with and seeking the counsel of individuals and organizations far outside the American mainstream. The Walter Annenberg Foundation is far outside the American mainstream!?!? Whatever. Spew on, Jonathan. It’s all you have left. Barack Obama has been mopping the floor with John McCain when it comes to newspaper endorsements. According to the latest tally from Editor & Publisher, Obama has been endorsed by 222 newspapers with total circulation of more than 20 million compared to just 93 newspaper endorsements for John McCain with circulations of just over 6 million. Obama’s total includes 43 papers that have switched from endorsing Bush in 2004. Four years ago I compiled a list of celebrity endorsements for the 2004 presidential race. This time around Wikipedia has done the job for me with Obama supporters here and McCain supporters here. In the Better Late Than Never category comes this Express-News story over the weekend about former Republican Congressman Henry Bonilla doing favors for some guy who was swindling a government-sponsored bank out of millions of dollars. A San Antonio businessman, while defrauding a government bank of millions of dollars, convinced a member of Congress to help put pressure on the bank so it would speed up processing loans to his clients, a San Antonio Express-News investigation has found. Then-Rep. Henry Bonilla, R-San Antonio, intervened on behalf of Andrew Maxwell Parker, president of San Antonio Trade Group, in 2005 as the Export-Import Bank in Washington was growing suspicious of Parker's business. Greater scrutiny had slowed the bank's backing of his clients' loans, so Parker wasn't making money. Bonilla's letters to the Export-Import Bank, written at the behest of Parker, were followed by e-mails from one of Bonilla's staffers, Patrick L. Anderson. He left Bonilla's staff in November 2005, and by the next month Parker had paid him $20,000 to lobby for SATG. The Export-Import Bank discovered many of his clients were defaulting on loans it had backed, forcing the taxpayer-funded agency to make good on them. Officials also found Parker had manipulated information in the loan paperwork before submitting it. So the bank stopped or delayed considering applications involving his firm. So the Ex-Im Bank was suspicious of this guy and was trying to back off on making loans to his clients who were defaulting on their loans and leaving the taxpayers to pick up the tab. So what did Congressman Henry Bonilla do after jumping into the fray? Parker complained to lawmakers, prompting Bonilla to propose a $7 million cut to the bank's budget in June 2005. Unbelievable! The bank is trying its best to be a good steward with the taxpayers’ money, and Henry Bonilla, like some Mafia enforcer, is punishing them for it by trying to slash $7 million out of their budget. And Bonilla was ENDORSED by the Express-News Editorial Board over Ciro Rodriguez while all this was going on. Bonilla’s response to all of this? He doesn’t recall. Can’t remember a thing. Probably some low-level flunkies on his staff are to blame. Pass the buck. Whatever. What a great public servant you were, Henry Bonilla! Thank you so much E-N Editorial Board for trying to foist this guy on us again and again. Rivard: It's Not My Fault! In his latest column, San Antonio Express-News Editor Robert Rivard blames the Publisher Tom Stephenson for the paper's ill considered endorsement of John McCain for president. Already, the dopey decision has caused more than 40 people to cancel their subscriptions to the local newspaper - the only daily serving the 7th largest city in the U.S.
Rivard makes no excuses for the endorsement and only tries to distance himself and his news staff as far from the decision as possible, noting that the editorial board staff is not even in the same building as the newsroom. Heh! I'd want to shun them too. I certainly do not condone people canceling their subscriptions, however. I think that is ultimately self-defeating and you end up with an even poorer newspaper that is unlikely to improve. What we need is more readers flooding the paper with letters and emails expressing their disdain for an editorial board that has continued to try and steer us off of every cliff that comes along at full speed. Rivard says the publisher is just conservative, but McCain/Palin/Bush/Cheney are not conservatives but radicals and wrongheaded to boot. Spare us the excuses, Mr. Editor. I find it hard to believe that the top editor at the paper has absolutely no sway in the editorial direction of the newspaper. Someone needs to grab that steering wheel and put us back on the right path.